As this week marks the beginning of March Madness, we thought it would be pretty cool to bring our community together in a light-hearted and incredibly fun contest. After all, all work and no play, makes investing a dull and unprofitable venture. With that in mind, why don’t you join us in our quest to pick the correct 2013 NCAA Basketball Tournament National Champion? C’mon! Join our online bracket pool! The player with the winning bracket (or the player with most points according to www.cbssports.com automatic scoring system) will receive a gift card with a face value of $50 in the mail. We will be keeping the name of the retailer a surprise until the final week. 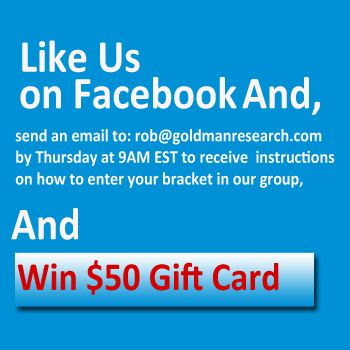 All you have to do to enter is like us on Facebook and shoot me an email ([email protected]) by Thursday at 9AM EST to receive instructions on how to enter your bracket in our group. No one affiliated with Goldman Small Cap Research is eligible. All rights reserved. Contact: [email protected] for further details. To get into the right spirit, here are my off-the-cuff Sweet Sixteen Picks. These are not final, but they are pretty close to my final (and likely losing) bracket.